After a year of testing, they're finally ready. Introducing our Sports Series Oil Cooler System! Reduces the high oil temperatures that N55 engine produces which helps reduce oil breakdown, improving the longevity of your car! Optional Aluminum Shrouding to direct airflow through the oil coolers for improved efficiency. Developed and tested on the race track! It's well known that the N55 engines runs very hot. Turbos that build a lot of heat and a small radiator play into why this engine runs so hot. A quick look at your gauge cluster on your dash after a few minutes of "spirited" driving, you'll notice oil temperatures over 250 degrees. Considering that most cars don't even exceed 230 degrees tells you quite a bit. As oil temperatures get too high, thermal degradation occurs. This is when the oil starts to lose viscosity due to heat and start to break down and becomes more susceptible to "shearing" or oil breakdown. An internal combustion engine like the N55 engine, imparts high shear forces on the motor oil, which is sandwiched between two rotating or sliding forces under load and heat. "Shearing" is when the molecular structure is essentially torn apart by these mechanical shear forces. Lower your operating oil temperature will greatly reduce this. Thus your motor oil is in better shape to protect the bearings in your car's engine, thus improving longevity. The M235i/335i/435i/M2 comes from the factory with a small oil cooler with a core size of 8.75"x4.75"x1" (222mmx121mmx26mm) which comes out to 41 cubic inches of core. 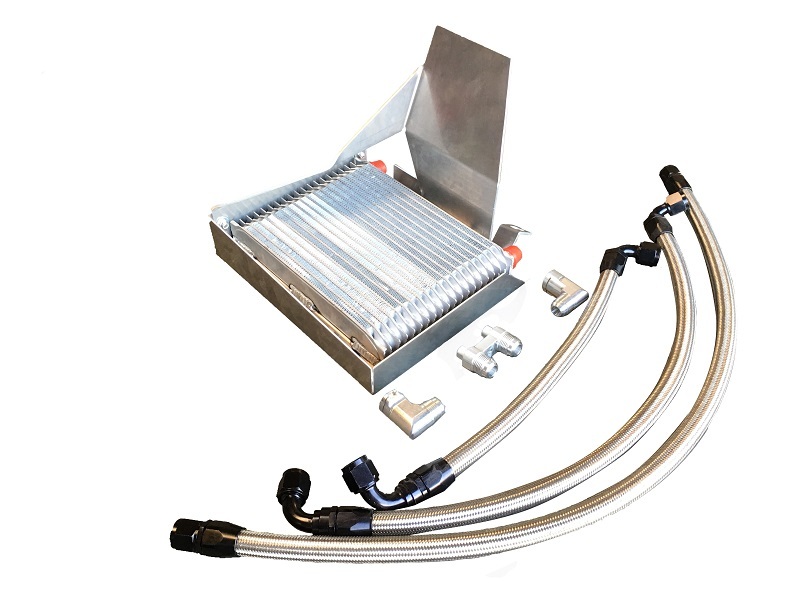 The Sports Series Oil Cooler system features a large 11"x8"x2" (280mmx203mmx51mm) oil cooler with a core size of 9"x8"x2" (229mmx203mmx51mm). The Sports Series Oil Cooler comes out to 144 cubic inches of core which is 3.5 times larger than the factory unit each! The Sports Series Oil Cooler mounts to its own box enclosure. This style box was developed on our 135i Time Attack race car and is brought here to our new F30 applications Louvers on the backside of the box enclosure ensures airflow through the oil cooler while protecting the oil cooler from road debris, especially debris kicked up from the front tires. During initial testing, our box enclosure had a big window (open hole) in the back for airflow. However, throughout the race season, it took so much abuse from rocks, tire and other debris kicked up from the front tires that we had to replace the oil coolers on our Time Attack 135i. Thus, instead of a big hole for airflow to flow through, we used louvers instead to protect the back side of the oil cooler. This effectively solved the issue without any affect on performance. Oil temperatures as well as oil temperature deltas stayed the same. Everything needed to install is included with the kits. No low quality, cheap fittings and lines made overseas used here. High quality Goodrich anodized black AN fittings and high end Goodrich Stainless Steel Braided Lines are used throughout the kit. PROMOTIONAL: FREE T-SHIRT: I don't want oneYes, MEDIUM please!Yes, LARGE please!Yes, EXTRA LARGE please!